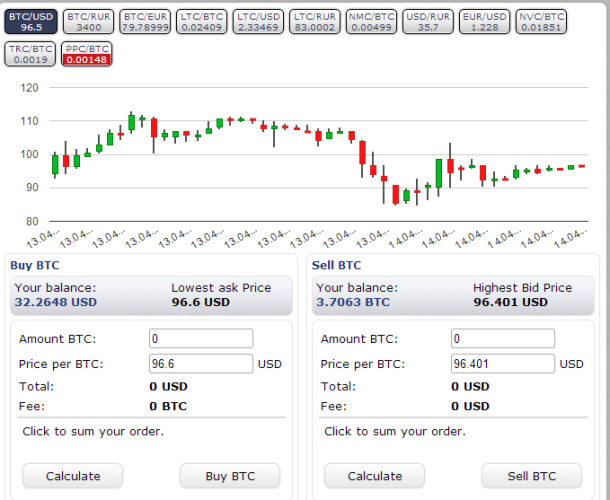 BTC-e is an exchange platform founded in July of 2011. It was one of the first Bitcoin exchanges in the world and currently is the second largest exchange in Europe, after UK-based Bitstamp, which speaks a lot of its volume. Anonymous Russian developers founded the trading platform, and the exchange is reportedly based in Bulgaria, but there are claims that its real base is in Russia, and even Cyprus is mention, but nobody knows exactly where. Although there are not much information about this trading platform, it consistently attracts new users and features some of the highest Bitcoin trading volumes in the world. An ideal choice for short term trading, but it’s too risky choice for long term trading. The exchange is built on the MetaTrader 4 platform, which is typically used for forex trading websites. BTC-e has a standard verification process. After registration and email verification, the user needs to verify identity. Without identity verification, users cannot make deposits, withdrawals or trade on the platform. The verification process is straightforward – user needs to provide a personal ID, which involves a high-resolution photo of the passport, national ID card or driver’s license. Besides, proof of address is required, which can be a utility bill with the user’s name on it or a bank statement. The documents cannot be older than three months from the current date. There are no limits regarding trading that are related to identity verification. There are three FIAT currencies supported by the exchange – USD, EUR, and RUR. The fees on BTC-e are sorted according to the fiat currencies and the transfer types. Transfers between BTC-e accounts via BTC-e code are free of charge. SEPA – 0.5 percent with a minimum of 15 EUR fee, 1 percent with a minimum of 100 EUR fee. The trading fee is 0.2 percent of the amount traded flat. The exchange offers an excellent range of cryptocurrencies and trading pairs. Liquidity is great, especially on BTC/USD and LTC/USD pair. There are normal market orders and limit orders, the rest of advanced orders is available through the MetaTrader 4 trading platform. The exchange doesn’t support margin trading directly, but in MetaTrader users can trade BTC and LTC on margin. Trading of futures and derivates isn’t possible on BTC-e. The interface looks good and is easy to use. Navigation between trade screens is very easy, and everything goes smoothly. The website is not responsive, making it unfit for mobile devices. The platform supports MetaTrader 4 which has its own Android and iOS apps. The exchange has an extremely limited FAQ page, which doesn’t help much. The support is offered via chat, email, and tickets, but only during business hours (8-16h, UTC+2). Typical response time is around 10 hours on average, which is pretty long time to wait for the response. There are a lot of complaints online related to BTC-e. Many of them are related to unexpected account bans, with permanently disabled withdrawals which are basically the theft made by the exchange. Security is a highly important feature for the BTC-e. They offer two-factor authentication and keep the majority of the customer funds in the cold storage. The downside is that the exchange hasn’t still provided a proof of reserve, so many users speculate that BTC-e has the only partial reserve, which would be unacceptable for many users if confirmed. BTC-e was hacked on multiple occasions, with the largest hack being the one from October 2014 when over 500,000 accounts were compromised. The exchange managed to fix the balances without the need to use the funds from the customer accounts. There were many Distributed-Denial-of-Service (DDoS) attacks during 2013 and 2014, which were a major disruption for the exchange. These attacks were mitigated when the trading platform started using CloudFlare proxy service. Also in the recent past (2017) they have been compromised and many users got spam and phishing mails to email addresses only used for the registration at BTC-e. There hasnt been a press release about that which makes BTC-e look pretty unprofessional. We also got those spam mails to dedicated test-addresses. Overall, not a really good exchange as they had a lot of security problems in the past. Also they are not very transparent – so we dont really recommend them. Ok for altcoin trading, but users should pay extra attention when using the exchange for other purposes. Jars should be hard. As in hard earned cash in my previous review. I’ve had no problems with them & they’ve always responded to my support requests helpfully. I’ve used the exchange for years and now the troubles start. Over the past day or so a supposed technical issue has transpired into the exchange been taken down due to money laundering, thefts including mt.gox and ransom ware. What now becomes of my jars earned cash? Yes I can provide, however a simple google search will provide all the information you need to show this site is scamming people. Here is a link to a forum where hundreds of victims are located. Can you provide any details or a link to more information? This place is currently withholding millions in BTC and LTC from long standing active users. If you or anyone has been affected by this company, please contact Action Fraud with the U.K. Police and the FTC in the United States. This company is currently under investigation. What internet do you operate on ??? This broker has a terrible reputation, simply do an online search and see for yourself. Cant understand where you’re getting 3.4/5, but here’s the problem…. How can bestbitcoinexchange.net give an unbiased opinion when it receives payment if the viewer clicks the btc-e-com link on this page ??? Now off you go and delete this comment like a good biased junk site.